Sequoia is the second oldest national park in the US, after Yellowstone. It was declared a national park in 1890 in order to protect the enormous sequoia trees growing in it, including General Sherman Tree, the biggest tree in the world. Sequoia is also home to the tallest mountains in the US (outside of Alaska): Mt. Whitney and Mineral King. Kings Canyon was declared a national park only in 1940. Besides the forest of enormous trees the park has caves, rivers, lakes and waterfalls. Over a million and a half people visit the park every year, with most of the visitors coming in the summer months. The park is open every day of the year, but two areas of it are closed during the winter: The road to Mineral King (in the south of Sequoia) is only open from mid-May to the start of November (if the weather allows for it to open), and the road to Cedar Grove (in Kings Canyon) open from mid-April to the start of November. The park has over 220km of roads and 1280km of hiking trails! Entry costs $10 per private vehicle for one week. The optimal length for a family visit to the park is two days. Any longer and you’ll start to hear complaints such as “We’ve already seen enough trees...” from your kids, even at the sight of one of the largest trees in the world. The park is in east California. It sprawls from San Joaquin Valley to the Sierra Nevada mountain range. Sequoia and kings Canyon are halfway between Los Angeles and San Francisco (and a little bit east), five hours away from each. The airports nearest to the park are Visalia airport, 58km west of Sequoia, and Fresno airport, 85km west of Kings Canyon. Two highways provide access to the parks. Highway 180 enters Kings Canyon National Park from the northwest via Fresno, and Highway 198 enters Sequoia National Park from the southwest via Three Rivers. Highway 180 provides the access to the farthest eastern vehicle-accessible point near Cedar Grove. There are no roads in the parks that cross to the east side of the Sierra Nevada. Additionally, there are no roads to enter the parks from the east (highway 395). The two parks are connected by a road called Generals Highway, a beautiful road 74km long which connects to highways 180 and 198 at its ends. The enormous differences in altitude in the park – from 460 metres to 4800 metres above sea level – lead to great differences in temperature and weather conditions throughout the park. Because of this you should be prepared for any sort of weather and dress up in layers of clothing (easily taken off or put on). Summer days are warm and temperatures can reach 38 degrees Celsius in lower altitude areas. The temperature at night is pleasant, around 20 degrees Celsius. In higher altitude areas (though not at the mountaintops) temperatures are around 24 degrees during the day and 10 degrees at night. The weather during spring and autumn is quite pleasant: Temperatures are anywhere between 11 to 26 degrees during the day (depending on altitude) and 0 to 11 degrees at night. Winters are rainy and snowy but the temperatures are fairly decent: 5 to 17 degrees during the day and -4 to 2 degrees at night. The park has several visitor centres. I recommend visiting one of them upon entering the park to receive maps and information and see the interesting exhibits they have on display. Foothills Visitor Centre is located near the town of Three Rivers next to highway 198, close to the entrance to Mt. Ash. This visitor centre is open every day of the year. The visitor centre in Grant Grove is also open all year round. Other visitor centres are located in Lodgepole, Cedar Grove and Mineral King and are open only from May to September. The main attraction of Sequoia National Park is, of course, the giant sequoia trees. Several areas of the park have especially large numbers of these trees. The most famous and unique trees in the park have names, and can be reached by short and easy footpaths. Other footpaths will take you between beautiful wildflowers and waterfalls. General Sherman Tree: A very short trail leads to the biggest tree in the world, named after a general from the US civil war. It is 83 metres tall and 31.3 metres in circumference. It is 3.2km north of Giant Forest Village (where one of Sequoia’s hotels is). Congress Trail: A round trail 3.2km long in the heart of a sequoia forest. The trail starts next to General Sherman Tree. It is highly recommended to anyone visiting the park for the first time. Its main attractions are the House and Senate Groups, the President Tree and McKinley Tree. Give yourselves one to two hours to tour this trail. This is a paved trail suitable for anyone, including disabled people. It is one kilometre long and circles a meadow called Round Meadow. In the summer, beautiful wildflowers are at the height of their bloom there. At the sides of the trail you will find written information about wildlife in the forest and the meadow. This dead-end road starts at Giant Forest Village and heads 5km southwest. Along the road are a number of attractions. 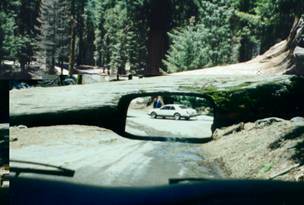 One is the Auto Log, a giant fallen sequoia tree on which you can drive your car. 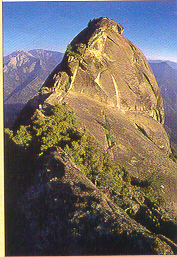 Another is Moro Rock, a large granite rock from which you can see a great view of the west side of the park. To get to its top you will have to climb 400 steep stairs, however, so it is not recommended for families with young children. Further along the road you will drive through a tunnel dug into the side of another fallen sequoia tree. The road ends at Crescent Meadow, which you can traverse on foot. In the winter this area is a nice place for playing in the snow and skiing. This area is in the south of Sequoia national park and is the highest altitude area you can reach in this park. It opens to visitors only at the end of May. The road to Mineral Kind is steep and winding, so drive carefully! You will arrive at a beautiful valley with many hiking trails, most of them quite long and recommended for people in good physical shape. The area has a variety of interesting rocks of different kinds, including granite and marble. If you are only visiting the park for one day, I recommend skipping this area as the drive alone takes an hour and a half each way. An 800 metre trail through a gorgeous canyon leads to a marble cave full of stalactites and stalagmites. Highly recommended! The cave is located between Ash Mountain and the Giant Forest near the Generals Highway. A guided tour of the cave starts at the entrance to spiderweb-like gate of the cave and takes 45 minutes. The temperature inside the cave is 9 degrees Celsius all year round. Bring along a sweater or jacket. The cave is open to visitors from mid-May to September, from 11AM to 4PM. Tickets can’t be purchased at the cave – they must be purchased at one of Sequoia’s visitor centres. General Grant: This is the third largest tree in the world. It was declared to be the US’s national Christmas tree. A 500 metre hiking trail leads up to it. On the way to it you will pass a historic little house, other giant trees and a huge hollow tree trunk which you can enter. The tree is 1.6km northwest of the visitor centre. Panoramic Point: An excellent viewpoint of the Sierra Nevada from the north side of Kings Canyon. Hume Lake: A picturesque lake in Kings Canyon 19km north of Grant Grove. In the summer months you can swim, sail and fish in its waters. You can rent a boat at Hume Lake Christian Camps. Canyon View: A beautiful, U-shaped viewpoint of Kings Canyon. This viewpoint is 1.6km east of Cedar Grove Village. A five-minute walk will take you to a roaring waterfall erupting from a crack in the granite rock. It is located 4.8km east of the Village. Highly recommended! A 4.8km one-way dirt road, suitable for private vehicles, which passes through a forest by the river. An excellent opportunity to spot small wild animals while driving.